As I have often said, I am firmly against Product Junkie-ism. I believe in finding a few products that work and sticking to them. However, there is no harm in trying out new things from time to time, and sometimes you will find new products that you prefer or work better. When you have colored tresses, it is important to protect your investment by using shampoos and conditioners that will minimize fading. 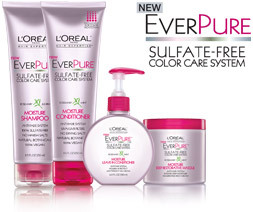 This shampoo and the accompanying conditioners are designed for colored hair, but L'Oreal also makes several other products for non-color treated hair in this same sulfate-free line (my daughter uses the EverCreme products). 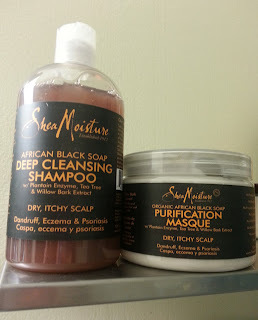 The EverPure shampoo and conditioner leave my locs incredibly soft, but not weighed down. I use the conditioner regularly, but the Restorative Masque is great for using after you've done a clarifying treatment on your hair (which strips out the excess oils and goo from your locs) or anytime your locs feel dried out. And the best part is that it leaves your locs smelling absolutely amazing with its rosemary and juniper scent. This has by far been my favorite shampoo and conditioner for color treated hair. I recently purchased this shampoo and conditioner on a whim while looking for a clarifying shampoo. It was on sale at Target so I decided to try it. As I was shampooing my locs, I honestly didn't like the feel at all. I actually had to look at my hair to make sure it was lathering, and it felt like I was drying my hair all the way out. The purification masque kind of had the same feel, like it wasn't very moisturizing. HOWEVER, keep in mind that these are clarifying products, meaning they are meant to strip the excess oils and buildup out of your hair. Once I moisturized my locs and dried them, they felt amazing. It definitely did the job of removing the gunk that was weighing down and dulling my locs, and my hair feels much softer and lighter and the sheen came back. I'm definitely keeping these in the rotation for the occasional clarifying treatment in addition to my apple cider vinegar rinses. I had previously been using Carol's Daughter Loc Butter for retwisting my roots, but I was never really 100% comfortable with it because it contains beeswax, which is a big bad naughty no-no for loc buildup. However, since I only using it sparingly on just the roots of the locs along my hairline (I latch the rest of my hair and rarely retwist my entire head), I was okay with using it. So when Ixora promised to develop a loc butter that contained no beeswax, I was intrigued. Like the Macani Miracle Butter, I absolutely love it. It is incredibly light and creamy, but has a great hold that leaves my roots smooth and shiny using just a very tiny dab on each loc. Ingredients include Nilotica Shea Butter, Hempseed Butter, Avocado Butter, Aloe Vera Gel, Coconut Oil, Jamaican Black Castor Oil, Macadamia Oil, Peppermint Oil, Teatree Oil, Vitamin E Oil. Again, smells amazing, and feels great on my scalp. I must also say that I've been impressed with how fast Ixora makes and ships their products. And for you environmentally conscious people (or people like me who love free stuff) they have a recycling program. Good customer service is always a plus with me. 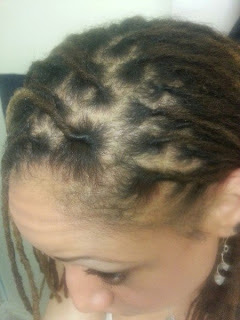 So there you have my all-star cast of products that have me absolutely in love with my locs right now. They have never felt so soft, light and shiny in all my years of locking. I often find myself mindlessly stroking my own locs because I just love how they feel, and I love when I turn my head just right and catch a whiff of their delectable scent. These are a few of my favorite things, and I hope some of them become a few of yours, too.